As I’ve mentioned in previous posts, we go away for a couple of weeks every year and while we *could* purchase our food, we bring most of it. What we can’t bring, we purchase at the camp store, fresh. Food: I’ve found lidded 5 gallon buckets work best for this. A little inconvenient, yes, but it keeps everything dry and clean. It also helps to prevent breakage and spoilage. I bring a fair amount of home canned goods, and they all come in glass jars. If I can pack ’em in with the flour, it provides some cushion. Plus, they stack, so you can go vertical with them and keep them out of the way. I typically take 4-5 buckets, depending on how many days we’re going to be gone. Each has a category, for example, last year I took the following: Spices, Dried goods, Canned goods x 2, and Snacks. Each bucket had the general category written on the lid for ease of use. 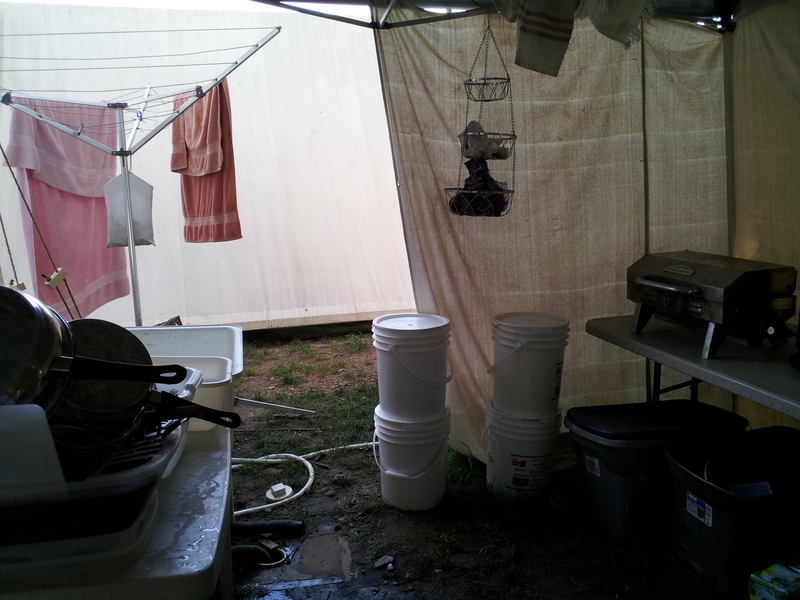 Structural: This is everything that makes the kitchen work, a tent, side walls for the tent (it’s easier to cook in a tent with walls when it’s raining than in a tent with no-walls), tables, a sink (we’re lucky enough to have a drain! ), the stove, the stove top oven and the grill. Other: This is all the other stuff that makes a kitchen work, pots, pans, silver, knives, the dish strainer, dish soap, an onion & garlic hanger (prevents rot) etc. I have scaled down my kit as much as I can for a family of 6, and can fit all of the above into 3 large bins and two milk crates – the crates make great ad-hoc shelving for frequently used items. Please note, we do carry chairs and a table to eat at, but they’re part of our living space and thus part of that kit. The rest of the space is carved up by 2 five foot tables into an L shape against the outter walls. On the longer of the two tables, and the one on which I’ve got full access are the cooking implements. Both grills, the propane tanks, the oven, etc., all live here. Under this table live the 3 bins that held gear, one of which has, by this point, been emptied and it’s contents put into use. That bin is nested under one of the other two to save space. The second holds the pans, and the third, other extraneous kitchen gear – can openers, etc. At the end of this table, on our downhill side, lives the garbage. It’s as far away from food prep and living space as I can get it and still keep things clean. The other table is my prep space. It has those milk crates with frequently used items, the knives, the cutting board, and anything else I can jam on it but still have space to work. Under this table lives our two coolers. After years of working with sub-par crappy coolers, I’ve been upgrading us, over the past 3 years, to the Coleman Xtreme 6 day coolers. They have handles, they have wheels, and most importantly? A drain. I can pull those puppies over to our camp drain and just let them go. No more dumping food and everything else out. Plus, they keep really cold on very little ice. Bonus all around! So, this is how I do it. It’s what I’ve learned over about 2 decades of setting this darn thing up every year, and some years failing. I try something new in the hopes that it’ll work better. This is a living process for me. How do you set up YOUR camp kitchen? Please feel free to share it with all of us in the comment section!! 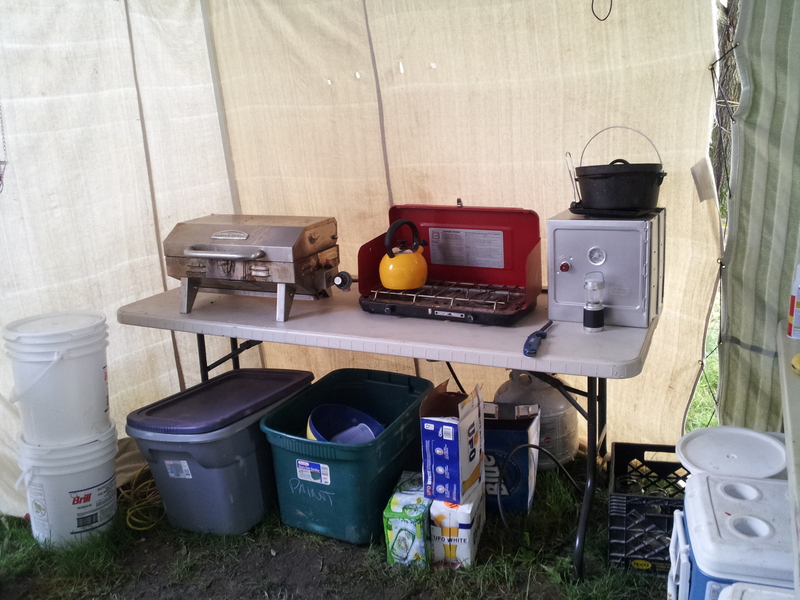 10 Comments on "Setting Up A Camp Kitchen My Way"
This is very similar to our setup. We have been spending one week a summer in Utah’s Uintah mountains for about 20 years. As the years have progressed the family has grown and we can have anywhere from 20 to 40 family members in attendance. A few years ago I managed to acquire a used Army GP Medium tent about 16′ x 33′ in size. We use one end for the kitchen and divide it from our living/eating space with a serving table. The opposite end contains two large two burner Camp Chef stoves with a third forming an L to the left and access is through a door between the two stoves in the center of the back wall or between the serving table and 3rd stove when the tent walls are rolled up. The last wall is our cleaning side and we use a collapsible camp kitchen that has cloth cabinets below, shelves above, and a sink hidden under the counter. A big thumbs up for those Coleman 6 day coolers. We use two of them to store our perishables and, if the items start out cold, the ice usually lasts all week. I have a couple of the new coleman 6 day coolers– i found that if you have soda bottles that you’ve cleaned out and filled with water and stashed in the freezer- you wont have to worry too much about ice. plus you’ll eventually have cold clean water too! Last year we were planning a 2 week camping/roadtrip from KY to Yellowstone and decided to surprise my mom for Christmas with the Cabella’s camping kitchen she had been drooling over for a year. It was the best investment we ever made!! (Besides maybe our trailer but that’s another story!!) It folds up very compact and flat. It has “cabinets” that zip and can be used to hold food (we just put them in the trailer at night if we do) or dishes/pots/pans. It has a shelf to place lighters, lighter fluid, etc. It has three work surfaces which really help to spread out and, under the center work surface is a built in sink with a drain. We LOVE our kitchen and had people stop us and ask us where we got it. It was expensive but totally worth it. We also set up a large 6 foot folding table for more work space. We set it all up under our 12 x 12 canopy that gets backed up to the back of the trailer. 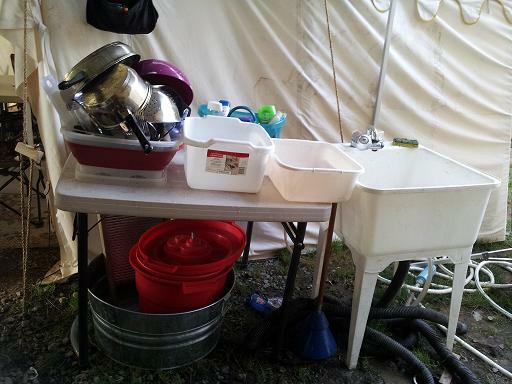 We can open the doors, get out what we need (on the trailer we keep rubber maid containers with food (canned goods, baking goods, spices, breads, etc), 3 drawer organizers to help keep things like towels, cleaning supplies, sun and bug supplies, dutch ovens, etc. Everything is organized and everything has a place. Each tent is even in a rubber maid container and each tent has a rubber maid container that holds that tents air mattresses, sleeping bags, etc. We are overly organized but we survived 15 days and 5 campsites on the road with 4 children 8 and under and loved it so it works!! Not raccoon proof. Tubs or not my kitchen includes the back doors of my van for food preservation. Love my Cabella’s kitchen also. Makes cooking easier as there is a place for all the utensils, lantern, spices. etc. Easy set up and take down. Had a gift certificate and waited until it went on sale. Bargain price. I also use an additional folding table for prep and cover it with a large vinyl tablecloth that hangs almost to the ground. That way I can store all the bin coolers, etc. underneath and still look neat. I see one little problem with your set up that I discovered a while back – that is cooking with a camp stove on a plastic table top. The heat will melt the table if you are not careful. I know because I have a very nice imprint of the stove in the top of my table. I have a new one now that has a metal fold out shelf where I now do the cooking. I love all your great suggestions. I agree with Ira – we have a heat protector under the cook area. We do not have such a special SINK. That is amazing – but lots of lugging. We have old fashion square bucket sink. We created a paper towel and real towel hanging unit with a closet rod and chain to hang from the ez-up frame over the sink/drying rack area. I also use table cloths to keep things like a PRETTY KITCHEN and encourage cleanliness. I do Civil War re-enacting and wish i could have such nice camp setups.i want to add another tent for just cooking, but canvas tents for CW are expensive to come by. We have a nice fire that we use copper boilers over one end to keep hot water over the fire at all times for dish washing, it has a lid to keep the ashes out. Then we have a three stage washing system step up, wash water, first rinse and second rinse. We then rotate the water to fresh rinse water, and shift down adding hot water to the first rinse water and add soap. It works for us. We use all cast iron cookware. We have the kids haul buckets of water. We have to keep modern coolers and such hid. Because we cook over an open fire, i still have yet to figure out how to cook french toast in the pouring down rain. But, we keep the fire burning. No propane or grills for us. It is all back to 1860S for us. The one thing I find very useful is a 3 drawer plastic unit that is very sturdy made, and useful to keep potholders, plastic ware, knives and kitchen tools, spices, and all the other little things you need to cook, including rolls of foil and extra table cloths, aprons and gadgets. Easy to transport, and no unpacking. The drawers go right under the table, and when you are done, just put everything away in the drawers and the drawers back in the RV. It really helped when I used two and a folded table top, and felt like an easy to use, streamlined kitchen. I label the drawers and they are somewhat see through, and my son says it looks like an Ikea kitchen 🙂 I also use a plastic organizer with a locking lid on the dining table for people who need condiments, salt and pepper, drink mixes etc. I pack it before we leave and it keeps people in their seats more, and you can buy goodies in individual packet to stuff it with. I’m a little OCD, and I enjoy myself more if its easy to put down, use and pack away. Pavilions are expensive for us too. We can use easy-ups if they’re disguised, so that’s what we do. Thanks for all the feedback on the heat protector – I’ve been looking with lust at the roll-up aluminum tables since, and an upgrade may well be in our future. My plastic tables have all gotten wet over the years, and the interior cardboard has gone crunchy with age – this makes for lots of waves in the surface. It’s always a learning experience!